Juffair neighbourhood used to be a suburban neighbourhood of Bahrain but now it is recognized as one of the Kingdom’s key and vital locations that lie close to top entertainment venues, worldwide hotels, and international restaurants. Now Juffair houses the Kingdom’s most sought-after high-rise residential towers that redefine luxury living and provide residents with a fully equipped lifestyle that is hard to find elsewhere. Under construction or completed; the high-rise residential towers in Juffair are considered to be an architectural innovation whether in their design, construction or their state-of-the-art facilities and amenities. Here we present you 5 of the top high-rise residential towers in Juffair. Combining contemporary living with the relaxing lifestyle, Fontana Infinity provides a way of living similar to that of resorts. 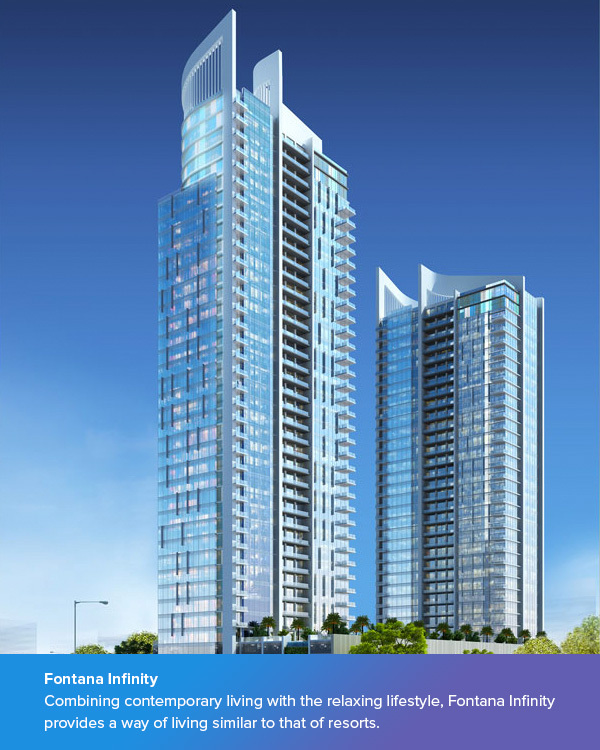 Fontana Infinity is developed by Fontana Development and it lies in a central location close to the heart of Manama where properties overlook Bahrain’s breathtaking corniche. 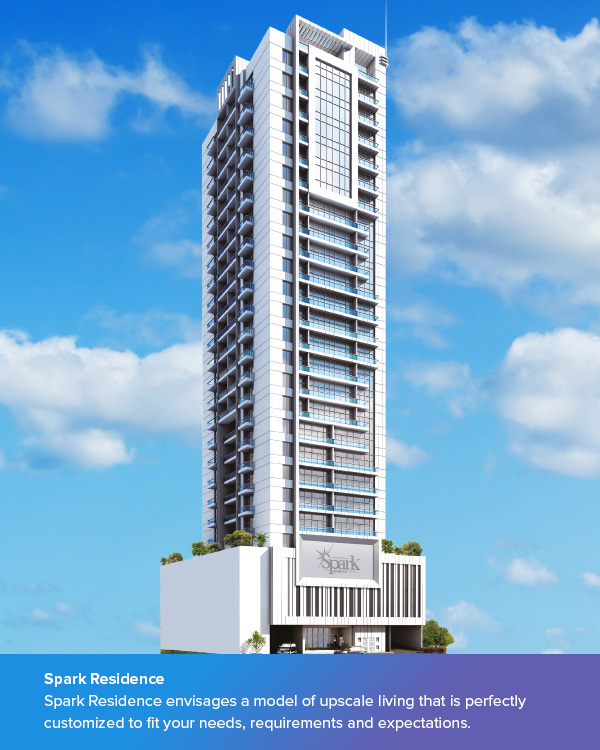 The under-construction project comprises of 43-storey twin towers that features a wide selection of real estate options from studios to one and two-bedroom apartments. Fontana Infinity features an exceptional “tropical paradise” that includes plants laid on 70,000 square feet. This one-of-a-kind project makes sure that residents don’t only have a luxurious stay but also it ensures their needs are all met through 24/7 Resident Care Team that provides fully integrated hospitality services such as housekeeping, 24-hour security, laundry, food delivery, and maintenance when needed. Fontana Infinity pledges to offer residents luxury and comfort under one roof. 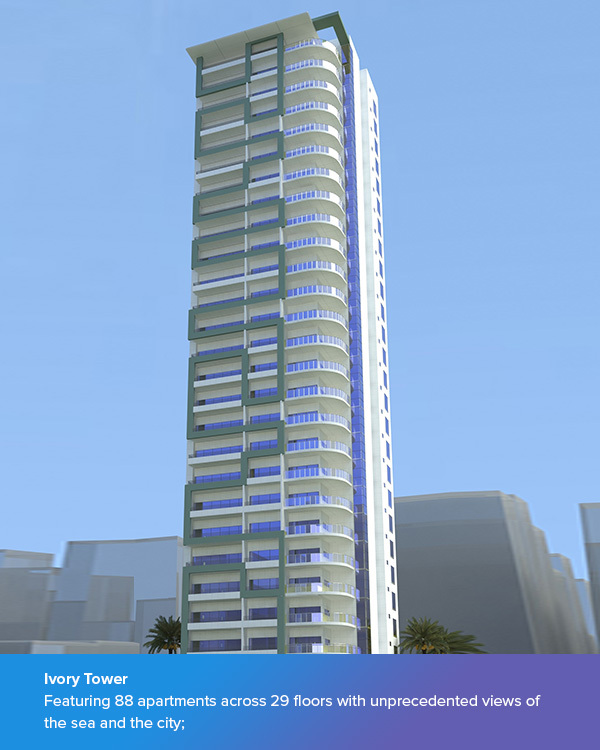 Saray Tower offers residents a full packaged living lifestyle in Bahrain’s most sought-after area; Juffair. In the hub of all activities and one of the liveliest districts in the Kingdom of Bahrain; Saray Tower features luxurious one-, two-bedroom apartments as well as elegant studios. The project lies extremely close to all the vital areas from the international restaurants, café’s, hotels as well as Bahrain International airport. With breathtaking views of the city, Saray Tower units are designed to reflect both the Mediterranean and Arabic cultures but with a more modern look and feel. 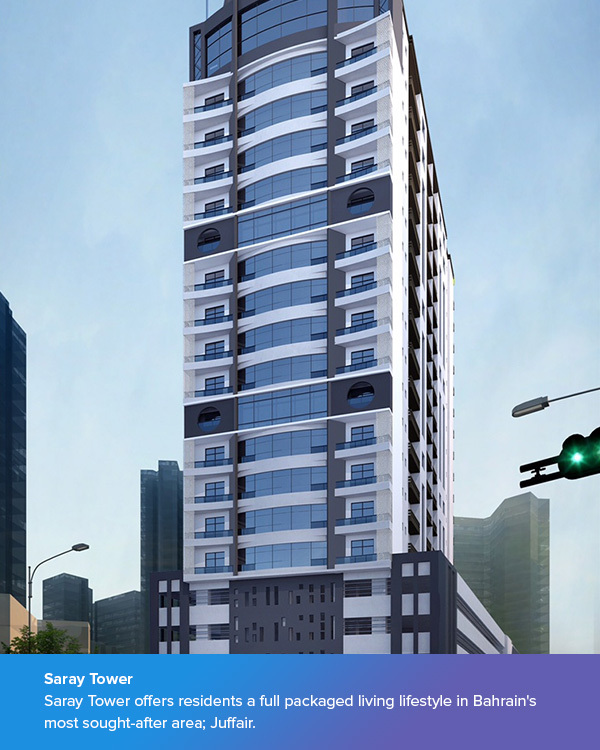 Saray Tower’s properties are available for sale and rent. Officially opened in 2012, Butterfly Residence is considered to be the perfect place for short or long stays as it all of its units is available for monthly or annual leases. Offering residents a state-of-the-art living where everything they need is at their fingertips, Butterfly Residence features one-, two- and three-bedroom configurations as well as two opulent penthouse suites. All properties are equipped with Wi-Fi, while all master bedrooms have a built-in Jacuzzi where residents can just lay back and relax. That’s not all, as every property also features a 55-inch LCD television comes with satellite TV and a home theatre system. And to top all of that, the building includes two swimming pools; an indoor pre-heated pool with a common sauna while the rooftop outdoor pool is surrounded by a well laid-out lounging and barbeque area. A fully integrated lifestyle under one roof, Butterfly Residence has a game room, a hair salon, restaurant, cafe, and florist. It is safe to say that one can find a little bit of everything in this building, all of which makes it hard to resist living in such haven. Featuring 88 apartments across 29 floors with unprecedented views of the sea and the city; Ivory Tower provides residents with comfort and quality life like no other development does. The building comprises of a wide array of amenities to ensure residents comfort such as fully equipped gymnasium, a large swimming pool, and luxury spa as well as recreational facilities and a children’s nursery in addition to a privately accessed 5—story car park. What’s even more fascinating about this development is that it has a private screening and party room to keep residents entertained at all times in addition to a game room that has everything from a pool table to darts. 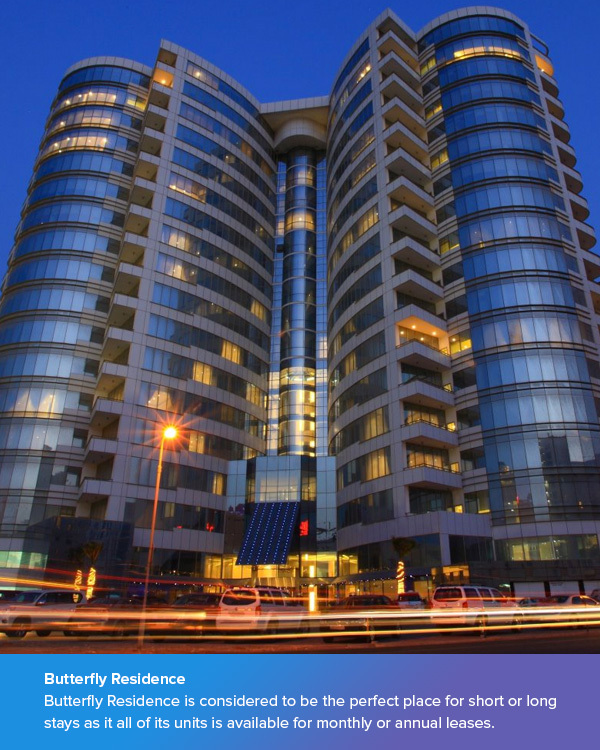 The 24-story building is only 15 minutes away from Bahrain International Airport and features various sizes and styles of apartments that range from studio apartments to one and two bedroom apartments. The development lies in a vital neighbourhood where residents will be in the middle of all the action where great choices of entertainment are available from restaurants, coffee shops, and malls. Developed by Bin Faqih, the lofty residence, Spark Residence, includes a wide array of facilities and amenities that promote luxurious living from Swimming pool for adults and kids Gents, Ladies gym, Receptionist 24/7 and a fully integrated security system. Spark Residence envisages a model of upscale living that is perfectly customized to fit your needs, requirements and expectations.